My name is Amberlie and I live in Virginia. I stand 5′ tall, and have a petite frame (I’ve been told). My life style is split between work, school, and casual home life. This is my last semester online at BYUI. I will graduate in December with my Bachelors degree. Almost three years ago I married into my husbands family business, the Metro Richmond Zoo. My husband and I both work at the Zoo and plan on living in this area long-term. The first thing that people usually ask me is, “What’s your favorite animal?” I have a slight obsession with chickens. 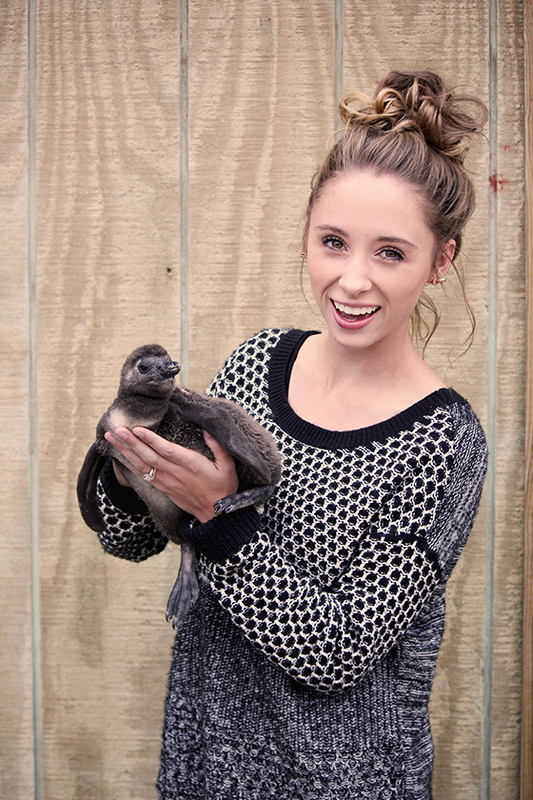 But I couldn’t resist this baby penguin that was born a few weeks ago. The idea of a capsule wardrobe totally stopped my world! The day I found Caroline’s blog, I fell in love with the concept because it was exactly the kind of inspiration I needed. I went through every. single. one. of the Unfancy blog posts. Why did I need a capsule wardrobe in my life? Developing my own capsule wardrobe has been a movement from walking into my full closet seeing nothing to wear, to loving every single piece in my capsule. Letting go. I have a sentimental relationship that develops with every item I own as soon as I try to get rid of it. It can be really tough to say goodbye to clothes you have spent money on. I couldn’t get rid of a single thing. At the end, I put all my clothing that did not fit into bins. And now? I haven’t missed the bins one bit. Sweater season is here! Nothing is cozier than a pair of soft jeggings + a slouchy sweater. I have a CONFESSION. I found this b&w sweater when I was on the hunt to buy a waffle knit sweater that Caroline purchased for her Fall Wardrobe. I couldn’t resist. It takes a lot for me to find fitting clothes that are small & short enough. Now that Fall has arrived I am all about the baggy trend and have no problem at all. Sleeves too long? Roll them up a few times to look effortless + cozy. Have you ever purchased a piece because of a fashion blogger? Let me know what it was! I'm Amberlie. I live in VA and work at the Metro Richmond Zoo. I will graduate from Brigham Young University- Idaho in December with a Bachelors in Marriage & Family Studies. I have been married for 2 1/2 years to Mr. Justin. I enjoy chickens, fashion, and youtube.